I would bet that everyone has at least one childhood memory of a person in their neighbourhood who was "strange' or considered "different". I remember seeing a man in Beccles who had a club foot and he frightened me no end with his big, clumpy black boot. In the Images of England book "Bungay To Beccles" (in two volumes) by Terry and Chris Reeve, there are some priceless photographs and images of Beccles past, and each page turned brings its former story to life. One particular image which has stuck with me is the one on page 71 of Volume One. "Susan Pipe, a well known character seen around Beccles in the early 1900s, selling her wares in all areas of the community. 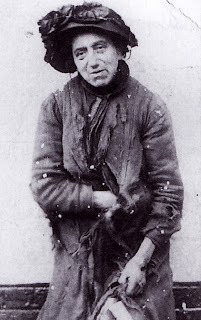 She was known to the younger members of the community as the ragged "bag lady". DEATH OF SUSANNAH PIPE: Aged 47, at her house in 11 St George's Road, Beccles. There was no bed, only a few rags in her bedroom, with a coverlet too small to cover her so she must have suffered much from the cold. She was a grand-daughter of the late James Mullett, master tailor, and member of the Town Council. On the death of her mother she succeeded to a lie interest in her grandfather's estate. She owned her own house and the neighbouring house. William Chatters, engine driver at the Castle Mills had lived next door to her for four years. Unfortunately she gave way to intemperate habits, and her husband separated from her. She got rid of practically all of her furniture to satisfy her craving for drink. She was seen picking up pieces of paper and sticks in the street to get a little warmth in the cold weather. She seemed very ill of late, and lack of nourishment and exposure contributed to her death. Once again I felt the need to investigate Susannah's life further and this is what I managed to uncover. The 1911 census return records her as having been married for seventeen years but she was living alone at 11 St George's Road. There were no children and Susannah had no employment. In the column which states the number of rooms she occupied, it has a number one. This would have certainly meant that Susannah lived at or below the poverty line, having one room in which to sleep, cook, and wash. According to the 1911 census, Susannah was born about 1869 in Rushmere, Suffolk. Whilst the latter was true, the former - her age - was not. Susannah was the daughter of John Newson and Sarah, nee Mullett, born in 1859. Searching the St Michael's Church Parish Register Extracts CD rom I was quickly able to locate her marriage record. Susannah Newson married Royal Pipe (yes, his name was Royal) on 4 February 1894. Her age was recorded as 32 and Royal's as 22. 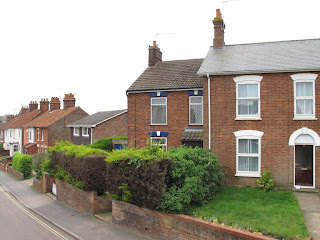 It is not known exactly how long they lived as a married couple as the 1901 census return shows that Susannah's husband Royal Pipe was living at home with his father James Pipe in Wash Lane, Beccles. His status was "married" so where was Susannah? She was found living alone at St George's Road, aged 37, status as married, and "living on own means". John Newson bachelor, farmer, of Rushmere. In 1861 John Newson and his wife and family were living in Rushmere and John was recorded as a farmer of 86 acres. What surprised me was there was also a Susannah Newson recorded in the household, aged 1. It transpired that Susannah claimed that she was 5-10 years younger than she actually was. RETIREMENT: James Mullett, Ballygate, tailoring, drapery and hat establishment retiring after 40 years. Business taken over by WG Cross. If we go back to the 1881 census return we indeed find Susannah (widow) at home with her parents James and Sarah Mullett at St George's Road (then written as St Georges Place). However, I haven't been able to locate where Susannah (the daughter) was. Previous census returns indicate that James Mullett travelled frequently to London, perhaps to purchase the latest fabrics and milinery necessary to keep up with fashion trends. James Mullett died in 1890 and left a substantial sum of money in his will. One of his executors was Edward Charles Darby, Timber Merchant of Beccles. The house at St George's Road was left to his widowed daughter Susannah, who then left it to her daughter Susannah (Pipe). When Royal Pipe left Susannah he went back to his father's home in Wash Lane but by 1911 he was living in Knights Yard, in Ravensmere and was still a Farm Labourer. He was recorded in the 1911 census return as married and his home had three rooms. With him though was Elizabeth Gosling, aged 50, widow, who was Royal's housekeeper and a third person, a lodger by the name of Emily Stare who worked at a Printing Office (possibly Clowes). When his estranged wife Susannah Pipe died in 1917, Royal married his housekeeper Elizabeth Gosling later that same year. He died in 1944.